Story cards in Gloom are an optional type of card that don't get shuffled in with the regular deck. Instead, two Story cards are selected at the start of the game and placed in the center of the table. Each Story card has a character requirement (usually, a pair of living or dead characters having a specific icon showing) that must be met in order to claim it for your family, as well as an effect that comes into play so long as the card is claimed. Claiming a Story card counts as one of your two plays. You can claim a Story card either from the center of the table or from another family so long as you meet the requirements. Or you can claim it from another family if you exceed them at the requirement. When adding up your points at the end of the game Story cards claimed by your family may have an additional effect, contributing to your miserably satisfying victory. “The Looking Glass” story cards are making their way all over the US and Canada. 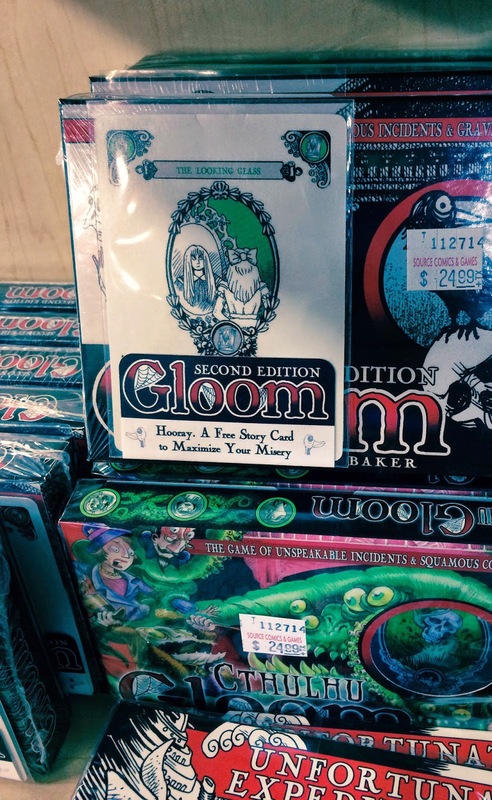 Look for them in sleeves attached to retail copies of Gloom and its expansions at these friendly, local game stores. AK: Soldotna - Hobbies, Crafts & Games. AL: Heleyville - Top End Gaming. AR: Little Rock - Game Goblins. AZ: Prescott - Game On Card & Board Games; Prescott Valley - Game On Card & Board Games; Sierra Vista - Pyramid Comics & Games. CA: Alameda - D20 Games; Bakersfield - Leeters; Bellflower - The Guild House; Berkeley - Games of Berkley; Chico - Bat Comics & Games; Garden Grove - Brookhurst Hobbies; Hilmar - GatePlay.com Game Store; Los Angeles - Whimsic Alley; San Diego - Game Empire San Leadro - The Comic Shop; Vacaville - Forgotten Path Games. CO: Broomfield - Kirin Games. CT: Manchester - Time Machine Hobby. FL: Crestview - GameMasters Guild; Davie - The Adventure Game Store. GA: Athens - Tyche’s Games; Canton - Dragons Eye Games; McDonough - The Hobbit Hole. 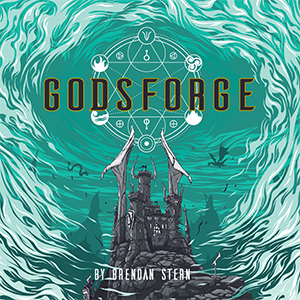 IL: Belleville - Fantasy Books; Carbondale - Castle Perilous Games & Books; Chicago - Chicagoland Games; Chicago - Da Sorce; Edwardsville - Heroic Adventures; Fairview Heights - Fantasy Book & Games; Marion - Fox Comics and Games; Villa Park - Tyton Games. IN: Decatur - DZ Gaming; Evansville - Book and Music Exchange; Fort Wayne - Game Knight; Goshen - Better World Books; Greenfield - Hometown Comics and Games; Hobart - Mr. Sweets Games and Candy; Huntingburg - Game Knight; Indianapolis - Comic Carnival; Muncie - Atomic Comics; South Bend - Griffon Books & Games. KY: Bowling Green - Local Gaming Store; Henderson, Louisville and Owensboro - Book and Music Exchange; Owensboro - MoneyTree; Richmond - Cafe Meeples; Richmond - Cosmic Oasis Game & Geek. MD: Frederick - Beyond Comics; Gaithersburg - Beyond Comics. MI: Ann Arbor - Vault of Midnight; Brighton - Just For Fun Hobbies; Dearborn - Sundance Games; Kalamazoo - Fanfare Sports & Entertainment; Flint - Rider’s Hobby Shop; Rochester Hills - Future Wars; Shelby Township - Sundance. 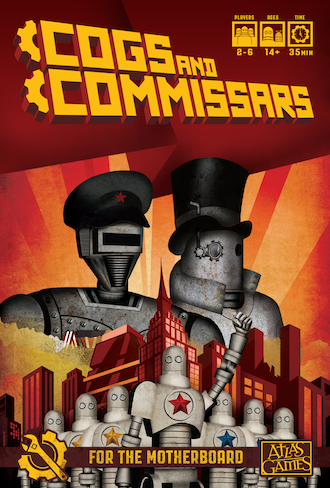 MN: Columbia Heights - Highlander Games and Comics; Grand Rapids - Infinite Games; Roseville - The Source Comics and Games; Waite Park - LionHeart Games. MO: Columbia - Magelings. MT: Great Falls - Know Dice Games. NC: Boone - The Mana Spot; Charlotte - Level Up Gaming; Four Oaks - Hobby Invasion; Greenville - Blue Ox Games; Richlands - Red Door Games. NE: Bellevue - The Game Shoppe. NJ: Barnegat - Trotta’s Hobbies; Westmont - Top Deck Games. NM: Farmington - Good Games; Santa Fe - Moon Rabbit Toys. NY: Catskill - Kirwan’s Game Store; Cheektowaga - Niagara Hobby and Craft; Syracuse - Monthly Boxer. 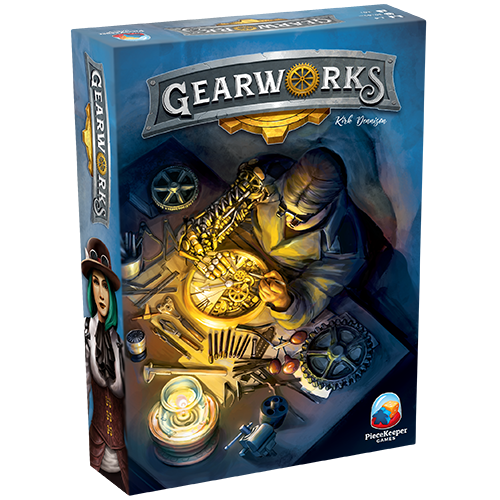 OH: Cincinnati - Rockin Rooster Comics and Games; Dayton - Sepco Entertainment LLC; Mandfield - Heroes Haven; Mount Gilead - Fun Factory; Newbury - Diversions Hobbies and Games. OR: Aloha - Rainy Day Games; Portland - Red Castle Games. PA: Cranberry Township - Hobby Express; Erie - Gateway Games; Westboro - Pop’s Culture Shoppe. SC: Columbia - Firefly Toys & Games. TN: Jasper - Beach Magic Games & More; Ooltewah - Epikos Comics Cards Games. TX: Arlington - East Wind Games; Coppell - Roll2Play; Fort Worth - Collected Comics & Games; Fort Worth - Collected Comics & Games - Keller; Fort Worth - Collected Comics & Games - TCU; Fort Worth - Sci Fi Factory; Hurst - Collected Comics & Games; Plano - Collected Comics & Games. UT: Orem - Boardgame Revolution; Riverton - Fongo Bongo Games; Salt Lake City - Dr Volt’s Comic Connection; Salt Lake City - Hastur Games & Comics. VA: Martinsville - Weston’s Dugout. WA: Bellevue, Redmond and Spokane - Uncle’s Games, Spokane Valley - Uncle’s Games, Tacoma - Tacoma Games. WI: Glendale - The Board Game Barrister; Greenfeild - The Board Game Barrister; Kenosha - Rockhead’s Comics and Games; Madison - Pegasus Games; Manitowoc - Bad Panda Games; Milwaukee - The Board Game Barrister; Sheboygan - The Game Board. 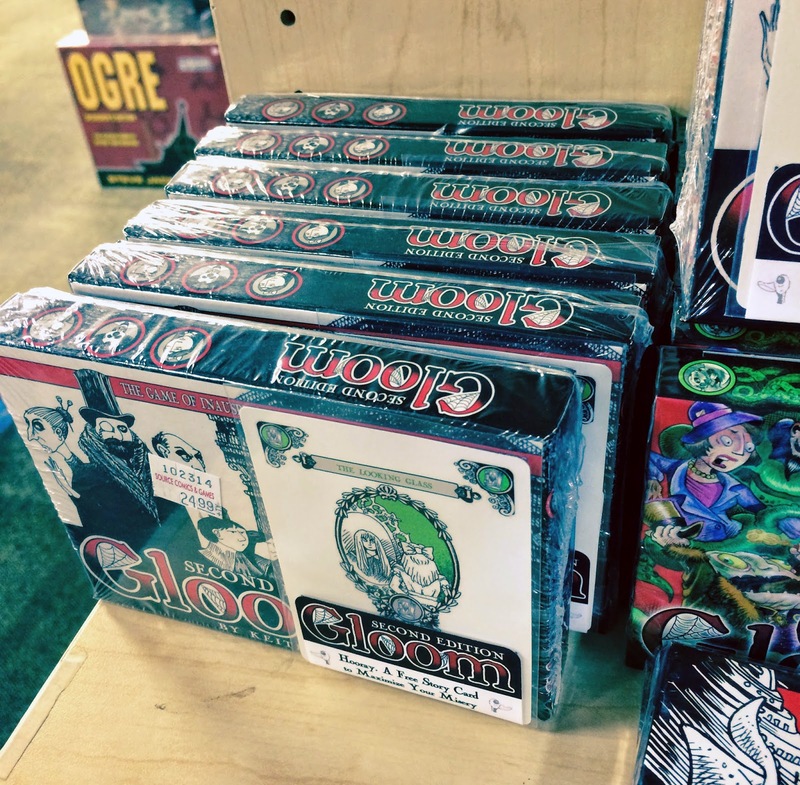 WY: Cheyenne - Gryphon Games & Comics; Rock Springs - Beasts & Barbarians Games. Do you run a retail store, but don't see your shop named above? We mailed to this list because all of these stores visited us at trade shows and conventions over the course of 2014 and asked us to add them to our mailing list. If you run a store and would like copies of "The Looking Glass" to dress up your Gloom stock, send an email to sales at atlas dash games dot com and we'll make it happen.